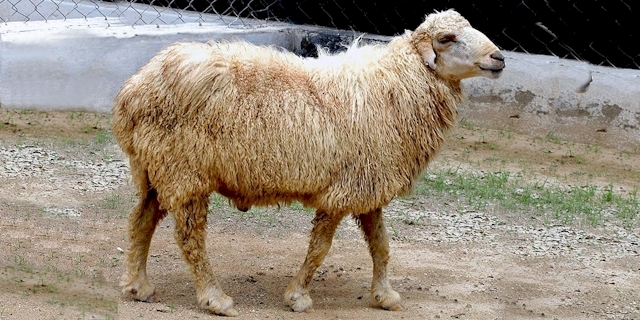 Damani sheep are a dual-purpose (meat and wool) sheep from Pakistan. They are mainly found in the Dera Ismail Khan district and part of the Bannu district in the Khyber Pakhtunkhwa province of Pakistan. Damani are small to medium sized, strong, and well adapted to their local environments. They are generally with white with a black or tan colored head and camel-colored legs. Their ears are small, and the udder and teats of the ewes are well developed. The average body height of the mature rams is around 61 cm at the withers, and around 53 cm for the ewes. They yield is about 1.5 kg of coarse fiber, per year. The rams on average weight around 2.7 kg at birth and the ewes around 2.5 kg; with an average litter size is one. The ewes are also pretty good milk producers, with an average milk production of around 80 kg during lactation. Their lactation period is about or over 120 days. The milk is of pretty good quality with around 5.8 percent fat. Their numbers decreased from over a million in 1986 to approximately 600000 in 2006.